London: Mayor & More: At Londonist: Vote, Vote, Vote! 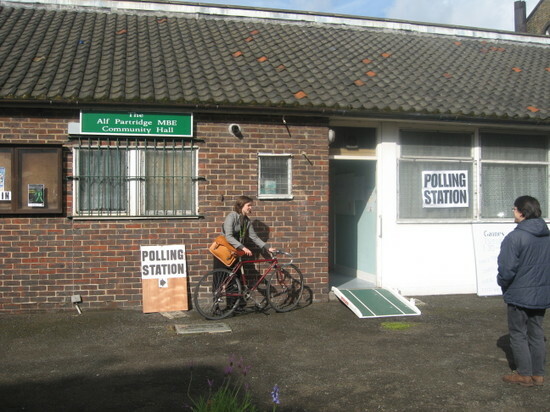 At Londonist: Vote, Vote, Vote! Vote, vote, vote! That's the partisan message from Londonist today as Londoners go to the polling stations to choose their next mayor and members of the London Assembly. As we write we are reliably informed that a new YouGov poll for today's Evening Standard will show Boris Johnson heading for victory over Ken Livingstone by six percent of the vote after electors' second preferences are taken into account. But any news stand message on our streets later today implying that the Tory is coasting to victory should be ignored. Every other polling company has predicted that the result is too close to call. The uncertainty alone means that every single vote - be it a first or second preference vote - for either of the two front runners is precious to them. Don't waste yours. What is more, the higher the turnout, the smaller the chances of the British National Party gaining a seat on the Assembly. There are concerns that the voting process, with its three papers to fill in and its "transferable voting system" for mayor, is still too complicated for many. To avoid confusion resulting in your either not using all your votes effectively or using them in ways you hadn't intended, this guide should be of help. So, vote, vote, vote - and may the best Londoner win! I'm stuck on my second preference. Any help would be greatly appreciated.